Twenty years ago, our family celebrated the first Thanksgiving in a brand new house. To show it off I invited my brothers and sisters and their families to come join our feast. All day I imagined the Norman Rockwell painting, Thanksgiving Dinner. Only I was the radiant Mom bringing the turkey to the table with the glowing faces of my family staring in awe. I just knew I’d be the star. As my guests arrived I scurried around putting the finishing touches on my masterpieces. With the table set, the food cooked to perfection, and everyone seated, my moment to shine had arrived. Well, when you grow up in a large family, you learn one thing – nobody is ever a star. My brothers in their truest form found something funny in everything I did. The jokes ran rampant with even my husband and kids joining in. Instead of a Norman Rockwell celebration, I had a Married with Children fiasco. Days later, wanting someone to share my pain, I phoned my Aunt Jeanne Marie in California. Patiently she listened as I went on and on. Barely coming up for air, I spared no one, “Jim did…and then Brian…Tim even thought it was funny…the kids said…” I felt better getting it all out. After an uncomfortable silence, her quiet voice gently asked, “Ellen honey, can I tell you how I see it?” I knew by her tone she did not share my indignation. She was right, I had heard the stories of broken relationships. And when I did visit relatives, you could feel the tension brewing below the surface. But Aunt Jeanne Marie was different, she defied the family history by choosing to model unconditional love and grace. Sadly, I was looking at the here and now while she had the perspective of multiple generations. Maybe that dreadful Thanksgiving, while I pouted, God celebrated a victory that had taken years to win. Perhaps all the time I spent feeling sorry for myself, heaven was rejoicing over the tearing down of strongholds. 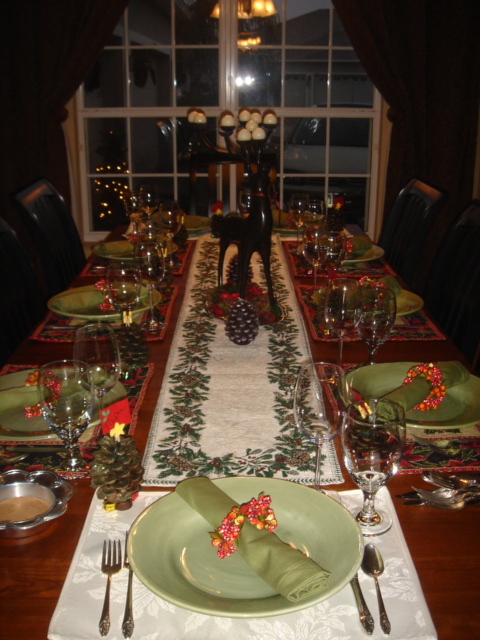 This year, I pray our dinner tables will be a place where walls come tumbling down. Where laughter reins, and the enduring peace of God is abundant. You never know, heaven just might be celebrating as we feast.